to the miniature world of Enchanted Gardens. being mesmerized with constructing terrariums. rocks, and nature's tiny objects. a tiny paradise in a clay pot. I'd have some fun in those cold and dreary days of winter. so angel vine it was. They all came home with me. 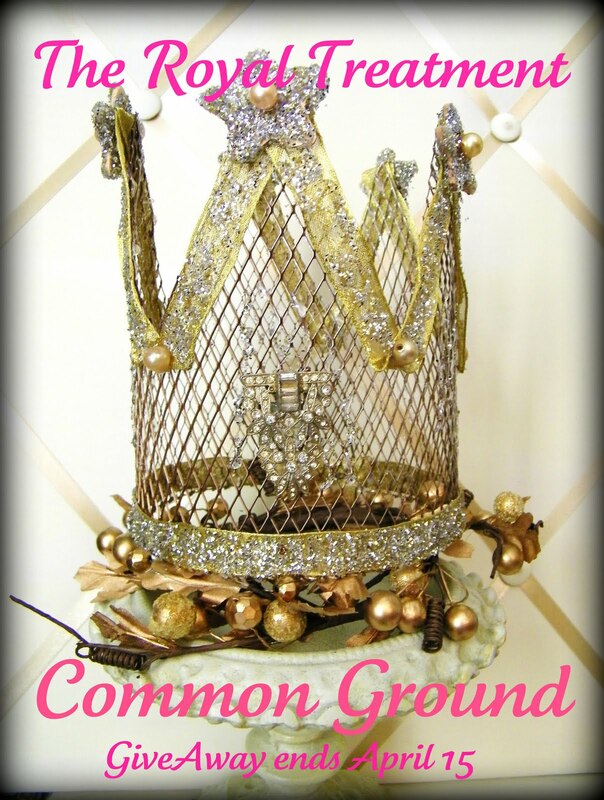 completes itself with a fairy size chandelier. "Midwest Living", that added to my inspiration. this one in a hexagonal design. out of the way of the gray fur babies reach. carries an extensive line of Fairy Garden elements. Shhhhhh......it even includes the fairies. so that you can see all the fun over there! Yard work and some flowers are on my agenda! Oh, that is so cute. You did a fabulous job putting it together. It works so well in your metal lunchbox. This is great! I remember wanting to do this myself years ago and I tried one with what I could actually find in a glass terrarium. I'm so glad to see that there seems to be more that is easily available these days. So cute! I'll bet it's so much fun to play with! Adorable! Do you visit Brenda at Cozy Little House? She has some miniature gardens that you would enjoy. Besides that her blog is amazing! I love everything miniature, too! I swear that one day we're going to have a HUGE miniature railroad set-up in our home, just so I can create an entire little village around it. Fun! How fun! I love miniatures, too, and would love to make one of these gardens. This is adorable! It looks like a lot of fun, maybe something my daughters and I could try. These are wonderful...love the little chandelier hanging from the arbor and the bench is so cute! What a great little garden. Love it in the lunchbox. Love these!!! Have fun with yours! Oh, I love the miniatures! How fun! Adorable! I SO want to give this a try! Thx a million for the inspiration! Fab! What a fantastic dream garden--that's my kind of yard work! I'm new to blogging, and really enjoy your blog. I hope you will follow mine! What a charming idea~ looks like it would be fun to try! We have been married 37 years, too~ I also remember being a newlywed and making terrariums! I love it when I can put out my fairy garden things. So does Annie, she has the best time re-arranging everything. My fairies bring vintage jewelry that they find, or anything shiny, so Annie loves to wear one of the fairy rings while she is here. I so need that trellis, mine don't have a chandalier! Those are so adorable! I really love the chandelier! too cute! You do the most incredible things. I've never even heard of Fairy Garden Elements. I'm just like your daughter. I'm just tickled pink over miniatures. I just never knew how to incorporate them in decorating so I never bought many, besides Limoges boxes. I just squealed with delight when I saw what you've done. Now, I want one too. Hope your shop is hopping. Thanks for coming by and visiting my Apron post. Have a beautiful weekend. We are supposed to be doing a fairy gardening class tomorrow...but I think you should come and guest speak for us! I too am a huge fan of miniatures...I still have a dollhouse that I started building about 10 years ago...I truthfully just don't have time to play with it! This might be something fun to do with my little goodies! Thank you so much for inspiring me! So adorable! I am so glad I stopped by!! I've been wanting to create a little fairy garden. I haven't found anything here that would work and now that I'm leaving for a while, it will have to wait. I love yours, Debra - so charming and the chandelier is the perfect touch! Oh how beautiful! Love the addition of the lunchbox... but my favorite is the tiniest, cutest ever chandelier. Have a blessed and creative day my friend! You won't believe this but I was just at my favoritr nursery yesterday and bought some very similar miniature items. I loved them so much but had no idea what I was going to do with them...just had to have the adorable little things! You have inspired me...so I am off to the nursey again to find some angel vine and get to work! Thanks dear friend! Uh Ohhhhh....I think the Pixies will be taking over my houseplants now! They are all just LOVELY! Thanks for the inspiration! Miniatures are always so fascinating and these little gardens are delightful! So nice stopping in and getting to know you a bit. Thank you for visiting my place and leaving your comment! I love miniatures and you garden vignette is adorable! That's awesome! I like the one you did for your kitchen best. I went to Inspirational Home today and had the best time picking out my mini garden stuff! Isn't Debra the greatest? I had already purchased an arbor and today she showed my some tiny lights to put on it! HAD to have them. Also got the little bench, watering can, wheelbarrow and tools. I already had a little pump in my stash so now I'll search for the perfect rocks to make a little waterfall. This will be so much fun! And I love the way yours turned out. Oh my gosh, I just discovered an Etsy shop 2 days ago that sells all these miniature garden things. 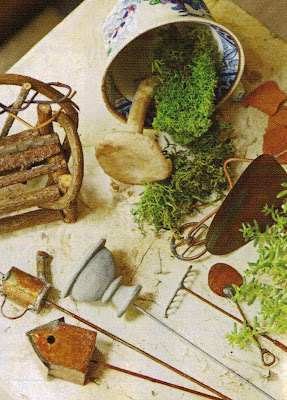 I've been dreaming up my miniature fairy garden since then! I'm soooo glad I found your blog, I'm going to follow! What a sweet idea! Love the little clay pots in there. I just participated in my first show and tell , come by and have a look. I love this...so beautiful in a small scale..just adorable. You have inspired me to make a fairy garden! Thanks for sharing. Your blog is beautiful! 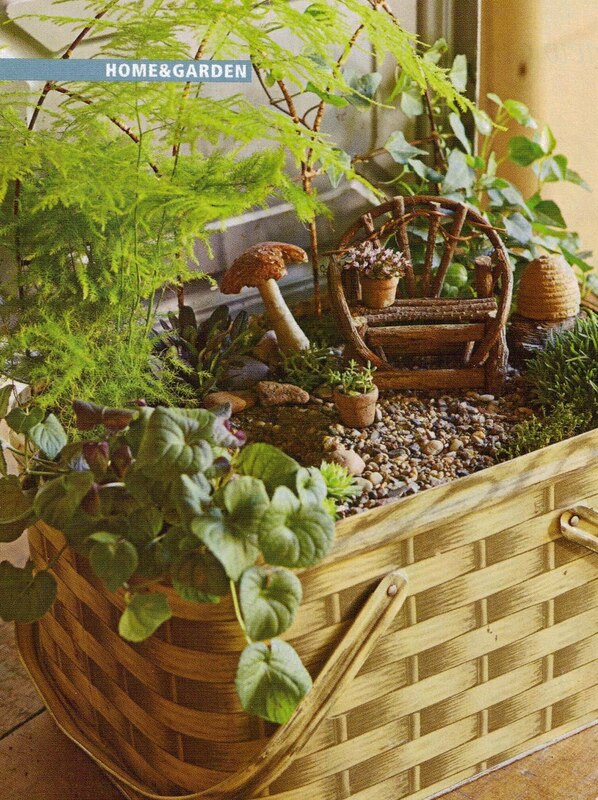 What a wonderful fairy garden..so cute! Oh, I LOVE this!!! I was excited at the beginning of your post going ohhh it is a fairy garden. And then I saw that you included that too. Just love this idea. I will have to try it too. Perfect for a summer pot. Way to go Debra! 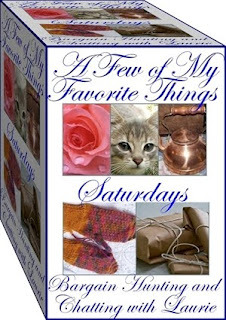 I will bookmark this post and if I get my done I will link you up to my post too. Debra, I love the little garden! My daughters would have loved this when they were younger! 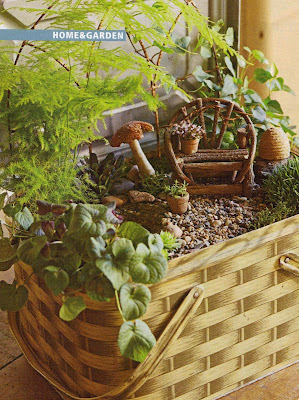 I will have to make a fairy garden with my granddaughters! So enchanting! I used to have tons of foxgloves with the little black spots inside the bells and I used to tell my daughters that the fairies obviously were dancing last night while we were sleeping! :) Such fun! Thank you for sharing! Can't wait to get started! What an enchanting idea. I may have to find a garden spot to create a fairy garden for myself. Thanks for sharing the photos and the link. Love your mini garden! Thanks for sharing it with us. How adorable! Such pretty miniatures; you've created just irresistible tiny worlds; I want to be 3 inches high so I can visit them!